There is a virtual assembly line of retro soul funk bands with music coming from across the seas inspired by the golden age of ‘60s soul. In truth, a site like ours filters through at least three such bands every month during our pre-screening process with very few ultimately getting a headline. Most of them are largely instrumental, heavily influenced by what the UK has deemed Northern Soul, but also by such bands as the J.B.’s, The Bar-Kays, The Funk Brothers, Booker T. & The M.G.’s, the storied session players of Muscle Shoals, and other classic soul outfits, usually off of labels like STAX and Bell Records. They seem to like the space where soul, funk, rock, and the blues all briefly converged for a time and experimentation with those bridges was high and recorded on analog tapes. Crate-digging musicians well versed in the art of homage. The best of them have acquired a reputation, like the Dap Kings, but many around the world are literally recording note perfect material precisely performed with all the life and energy of a dusty, but beautiful museum artifact. In their efforts to get the sound and production techniques they love “just right,” they often lack the passion, moxie, and the rawness that was more than just chord changes and horn charts. What they’re too often missing, in addition to great vocalists, is the spirit of the blues, the lifeblood of soul. On their sophomore release with Wah Wah 45s, Favourite Worry, The Milk rises as crème fraîche above the spoiled buttermilk, not only leaving the unvarnished and the indigo in the mix, but standing proudly on it for height, surveying bright horizons. Without an ounce of pretense or artifice, The Milk howls, screams, cries, and yells in voices ragged with pain and a lived life. In the begging of “save me, save me” on “No Interruptions,” you hear they know something about the blues. They also know how to make something sound clean and beautiful, especially in harmony as with shimmering aural walls of “Wanderlust” or the melancholic doubling on “Loneliness Has Eyes.” They haven’t forgotten that ‘60s soul includes the frayed belts of Janis Joplin and the soulful California harmonies of the Mamas & The Papas and The Beach Boys too; not everything honest came out of Memphis and Detroit. They aren’t all loose and undisciplined in their displays of vulnerability, as the vocal precision of lead vocalist Rick Nunn’s phrasing illustrates on “Darling What’s Wrong.” Nunn does so in a voice quivering with emotion, but always in the pocket and coloring with skill. Nunn (who also plays keys and guitar), along with drummer and keyboardist Mitch Ayling and lead guitarist Dan Legresley, have a special blues rock vocal blend as spotlighted on “Deliver Me,” a mid-tempo groove that approaches balladry and is as smooth as it is haunting. Bass guitarist Luke Ayling doesn’t sing, but his contribution is ever-present in its weight, and is irreducible. There is such a fine line between being raw in soul and sounding an unrefined mess, but The Milk balances it, always leaving room for spirit to enter the room and the music. This musical tension is most evident on “Favourite Worry,” whose opening coos yield to blues cries bordering on the imperfect and are undergirded by vibrating instrumentations and doo wop vocals that by the bridge all but devolve into an emotionality that seems on the verge of bursting free with Nunn’s ecstatic shouts, each musician barely holding on to his training in the vamp out. 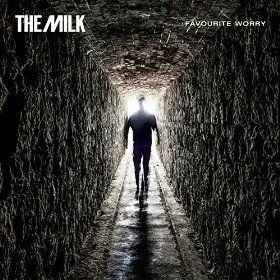 The result of which on “Favourite Worry” is a rare bird that soars, one reminiscent of Joe Cocker during his years with the Mad Dogs & Englishmen. Rawness aside, The Milk’s skill and technique as musicians is never really in question, as evident on the perfect hem of “Lose That Way,” with nary a loose or dangling thread from its silken Smokey Robinson meets The Impressions fabric. There is confidence when The Milk gets dirty and dark with the street sounds of “Trouble” or an up-tempo roller like “Don’t Give Up The Night,” both intricately layered compositions with deceptively simple melody lines. But, they can be as playful and sunny pop with their sound as the next ‘60s retro outfit, going for more an early Elton John on “What Did I Do To My Love” if with a far more sanded vocal than Sir Elton has ever proven capable. Producer Paul Butler (of Michael Kiwanuka fame) ensures a expertly mixed variety of music palettes that travel the late ‘60s to early ‘70s expanse, but never sacrifices project cohesion and whose use of vintage production techniques here serves to add texture and nuance to The Milk’s work. Yes, there seems to be a million retro soul outfits these days, coming from such far away places as Italy and Japan, even New Zealand, but they aren’t the UK’s The Milk. In these four musicians’ efforts at being great students of an era that has been heavily mined, and is increasingly becoming a musical parody through clichéd and cheap imitation, they have managed to remember the most vital lessons from the albums of their Black American Music forbearers: no matter how influenced you are by the greats, to still be yourself too; to sing your truth and write your lyrical blues as honestly and starkly as you can; and, to leave everything you have to give as an artist, to leave all of it on the stage or the studio floor. On Favourite Worry, The Milk has earned nothing but exemplary marks on this report card. Their forbearers would be proud. Highly Recommended.